Be honest with yourself, your attorney, the trustee, the court and anyone else involved in your bankruptcy case. The first question to ask is do you really need the help? Are you someone who has a small amount of debt that is manageable over the course of six months to a year or are you someone who is drowning with insurmountable debt which cannot be remedied on your own? Once you come to the realization that you need help, you will want to make full disclosure of your assets and liabilities and your statement of financial affairs with your attorney. Your attorney will then be in the greatest position to advise you as to your rights and obligations under either chapter 7 or Chapter 13 of the bankruptcy code. Once your case is underway, you want to answer the trustee honestly and provide whatever documentation the trustee is seeking. If you wind up in court having to testify before the judge, you want to make certain that you answer honestly. You do not want to subject yourself to sanctions for perjury. Lastly, when dealing with creditors and other individuals associated with your bankruptcy case, be forthright and honest. If you have questions concerning anything in your case, refer those questions to your counsel. You are not going through the process alone. You have exceptional counsel that you hired to assist you every step of the way. If you are thinking of filing for bankruptcy under either chapter 7 or Chapter 13 of the code, do a little homework. There is a ton of information available from the various bankruptcy organizations and local attorney’s websites. You can start with the American Bankruptcy Institute (ABI) or the National Association of Consumer Bankruptcy Attorneys (NACBA) to learn more. You can also look at the United States Department of Justice website which goes into detail on the various chapters available to you and how each chapter works. You should also seek out local counsel to learn about what is needed at your local level. Each jurisdiction is different despite the fact that bankruptcy law is federal. The judges have local rules and the trustees have different procedures that they implement for cases under their jurisdiction. Take the time to read many of the frequently asked questions and watch as many videos as you can until you feel comfortable with the process. If you become informed, you will have a higher comfort level when going through the process. You will not be shocked by anything and the explanations given to you by your attorney will be somewhat familiar to you. It is clients that go into bankruptcy blindly that often have the worst experience. In addition to being honest and informed, you need to follow your attorney’s advice. This starts with the initial consultation all the way through until discharge. Bankruptcy law is very specific. There are all kinds of potholes and obstacles that must be either managed or avoided during your case. Timing is also an important issue. There are documents that need to be provided before a case is filed and there are requirements that must be completed before and after the case is filed. Your attorney is going to be setting out the roadmap for you with specific instructions and advice. You need to follow that advice 100%. If you do not understand something or have a question as to why something is required, please ask your attorney. Don’t simply assume that it is not important. Everything that your attorney is requesting is being done for a reason. For example, prior to your meeting with the trustee, the trustee wants to see at least one year of your most recent federal tax return and at least 60 days’ worth of pay check stubs. If this information is not provided to the trustee, there will likely not be a hearing held. This means that your case will not proceed. This is just one example of many in which your attorney will be seeking information from you in order to move your case through the process. 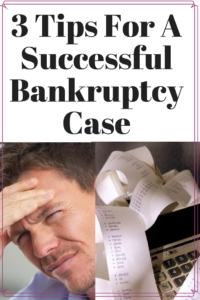 In conclusion, I have outlined three important tips for having a successful experience while going through a bankruptcy case. Be honest, be informed, and follow your attorney’s advice. By doing so, it will go a long way to ensure that you have a successful bankruptcy case. This will likely and hopefully be the only time that you need to file bankruptcy in your life. Why not make it as pleasant an experience as possible?